The polished oval sapphire is as large as a person’s palm and weighs 1404.49 carats (281 grams), according to a local industry body that certified it, the Gemmological Institute of Colombo. “My estimate (of its value) is about $100 million,” he told Reuters during an interview in Sri Lanka, but declined to say exactly how much the stone cost when he bought it in September. In 2014, a 392.5 carat Sri Lankan sapphire known as the “Blue Belle of Asia” sold for 16.96 million Swiss francs ($16.94 million) at a Swiss auction. 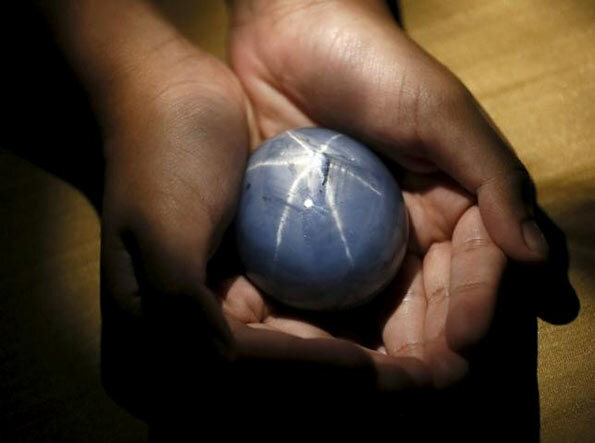 The National Gem and Jewelry Authority of Sri Lanka confirmed the stone was the world’s largest blue sapphire. It was mined in Sri Lanka’s central district of Ratnapura and is a classified as a natural corundum un-heated blue star sapphire. Local legend says Sri Lanka’s world-famous blue sapphires were formed by the tears of Adam after God expelled him from paradise. Britain’s Princess Diana wore an engagement ring made from a blue oval sapphire from Sri Lanka encircled with diamonds, while Prince William’s bride Kate Middleton wore a similar sapphire and diamond cluster, also using a Sri Lankan stone.